The information in this section pertains to iOS 9 and prior. For iOS 10 and later, please see the User notification framework guide. Sound or vibration - iOS can play a sound to notify users. If the sound is disabled, the device can be configured to vibrate. 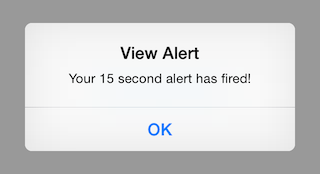 Alerts - It is possible to display a dialog on the screen with information about the notification. Badges - When a notification is published, a number can be displayed (badged) on the application icon. iOS makes it fairly simple to create and handle local notifications. 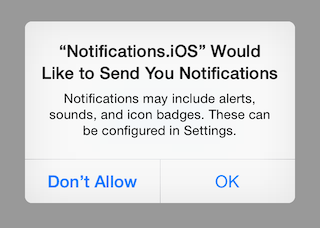 First, iOS 8 requires applications to ask for the user's permission to display notifications. Add the following code to your app before attempting to send a local notification - the attached sample places it in the AppDelegate's FinishedLaunching method. Note that if the user chose to not allow notifications then nothing will be displayed. If the notification sound is longer than 30 seconds, iOS will play the default sound instead. There is a bug in the iOS simulator that will fire the delegate notification twice. This issue should not occur when running the application on a device. iOS applications handle remote and local notifications in almost exactly the same fashion. When an application is running, the ReceivedLocalNotification method or the ReceivedRemoteNotification method on the AppDelegate class will be called, and the notification information will be passed as a parameter. 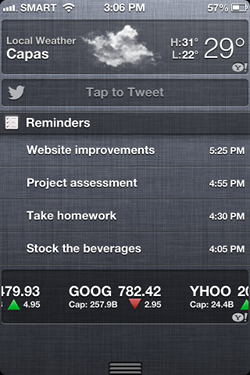 An application can handle a notification in different ways. For instance, the application might just display an alert to remind users about some event. Or the notification might be used to display an alert to the user that a process has finished, such as synching files to a server. This section showed how to create and publish a notification in Xamarin.iOS. It show how an application may react to notifications by overriding the ReceivedLocalNotification method or the ReceivedRemoteNotification method in the AppDelegate.